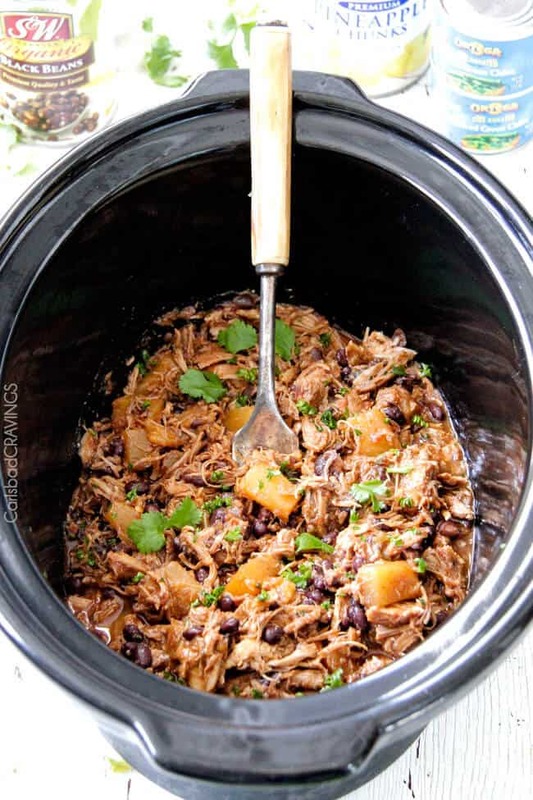 Slow Cooker Sweet and Spicy (customizable) Pineapple Salsa Pork – crazy good, flavorful filling for burritos, tacos, burrito bowls, salads, etc. 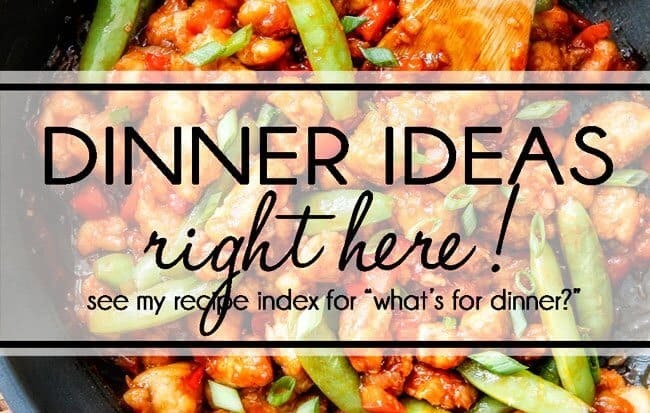 In addition to weekly meals, I love making this for company because its SO good, easy and versatile! 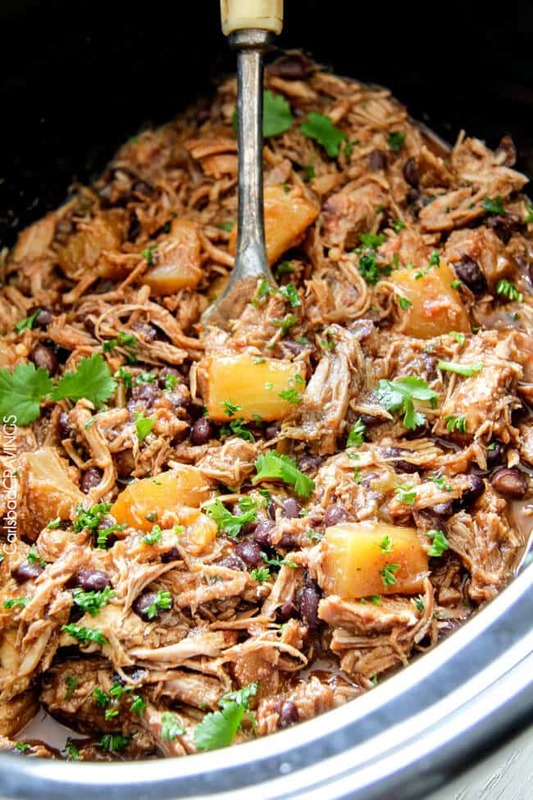 Have you tried my Slow Cooker Pineapple Salsa Chicken? 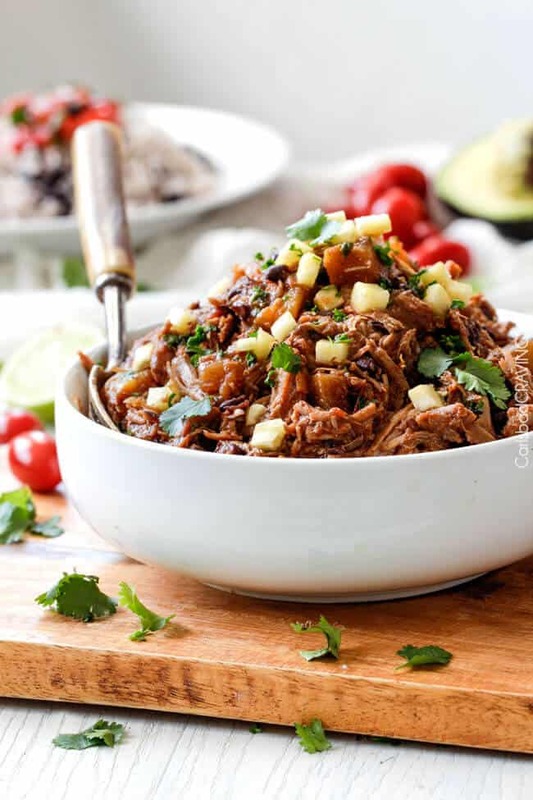 Its one of my all time favorite recipes, so naturally, I wanted another way to devour the slightly tangy, sweet and spicy flavors so Slow Cooker Pineapple Salsa Pork was born. Beautiful day. 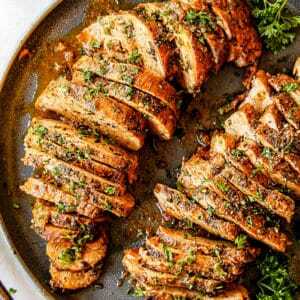 Its crazy tender, moist, versatile and bursting with flavor. 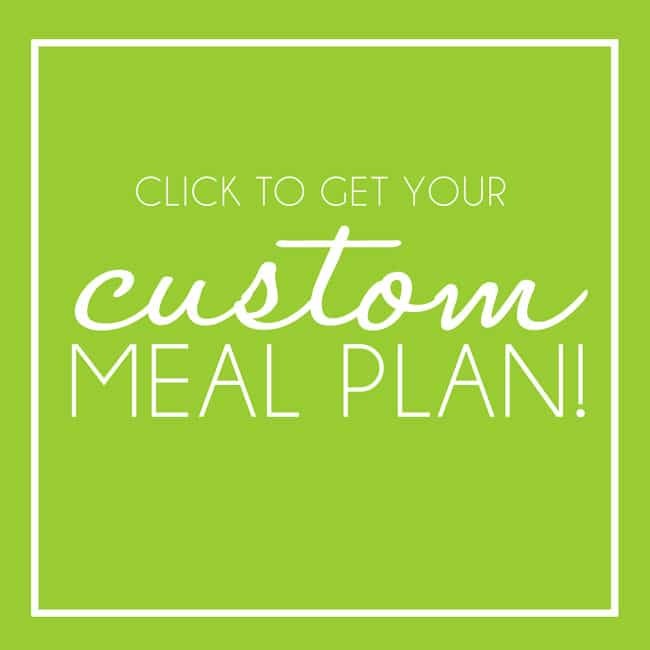 And don’t worry about the “spicy” part – that is completely customizable based on your preference. You start with just a little hot sauce and add more to taste at the end – or a lot to taste at the end if you are like me! 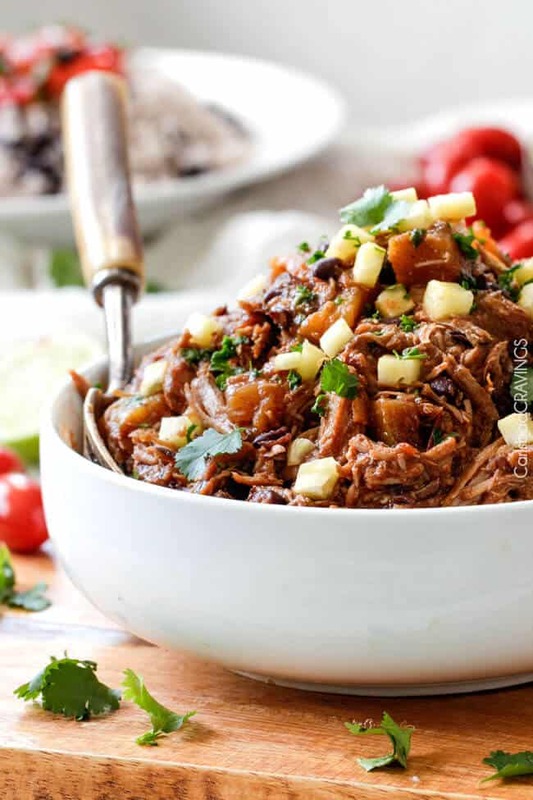 Along with my love of the flavor profile, I am in love with just how easy this Slow Cooker Pineapple Salsa Pork is. Its one of those “dump and run” kind of meals that fills your entire home with the aroma of can’t-wait-unit-its-done yearnings. And its all made possible by cans! 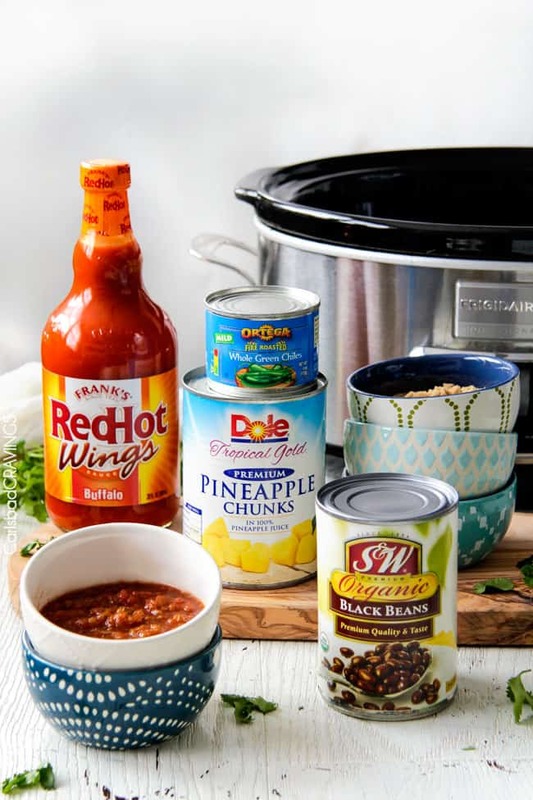 I love just how easy cans can make cooking or as more eloquently stated, “You’re more successful when you have the can on hand,” so I’m excited to have teamed up with Albertsons to celebrate National Can Month! The seal of a can guarantees freshness, flavor, nutrition and fantastic convenience – everywhere, every time. I love keeping my pantry well stocked with my favorite canned goods so I can always make flavorful and healthy dishes at a seconds notice. If you were to open my pantry, you would always find canned green chilies, pineapple, crushed tomatoes, black beans, kidney beans, corn, coconut milk etc. staring right back at you, waiting to deliver more vitamins and minerals to your everyday meals. 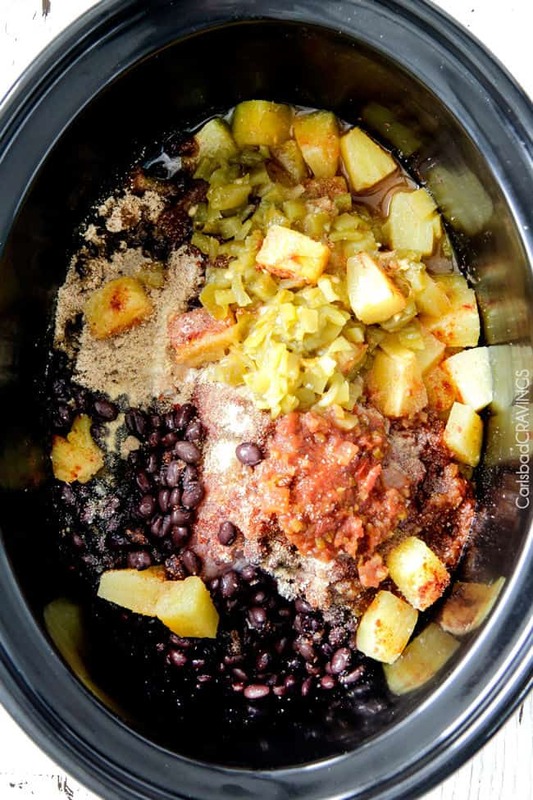 For this Pineapple Salsa Pork, I used three of my very favorite canned ingredients – diced green chilies, pineapple and black beans. 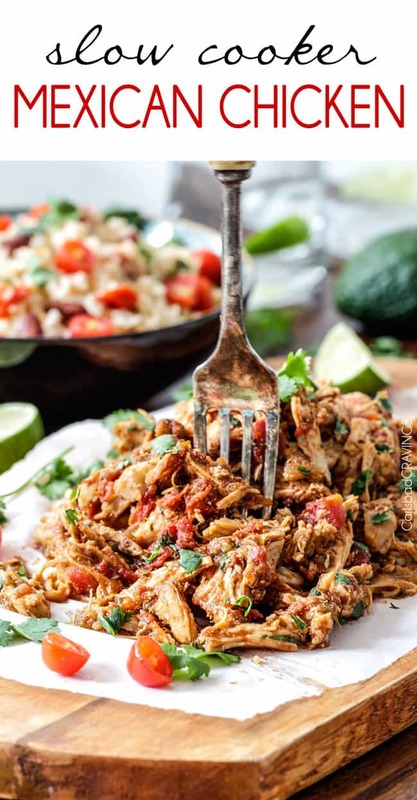 You throw all of these ingredients into your slow cooker along with salsa, brown sugar, a cast of spices, hot sauce and your pork that has been marinating in soy sauce and Coke (marinade is optional but highly recommended). Let it cruise until the pork is fall apart tender, shred it, and let it drink up all the juices for 30 more minute or so. And then its eating time, the very best time! But your work isn’t done yet. While cans have made making this Pineapple Salsa Pork easy peasy, deciding just how to eat it is the hard part. But I also personally love making these Smothered Baked Pineapple Salsa Pork Burritos with Creamy Avocado Sauce…coming soon. Oh decisions, decisions! 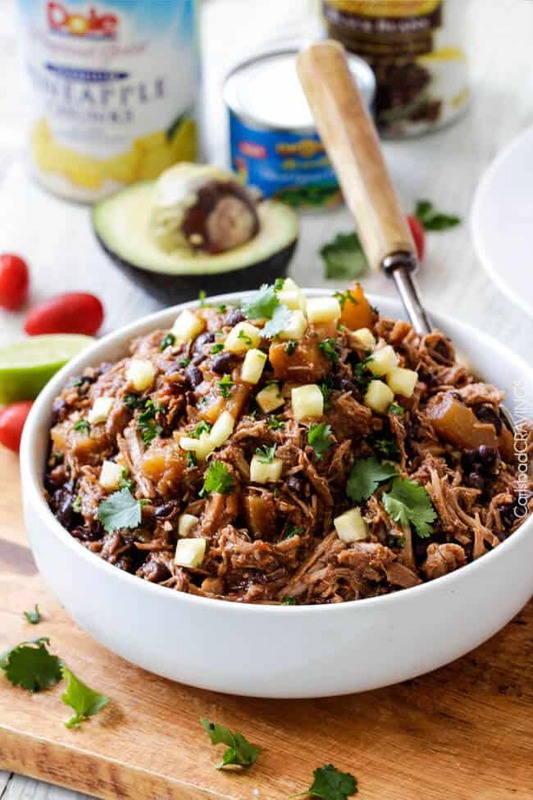 But one thing is guaranteed, you will love this versatile Slow Cooker Pineapple Salsa Pork and Albertsons is waiting with shelves of cans to make your every day life easier – and more delicious! 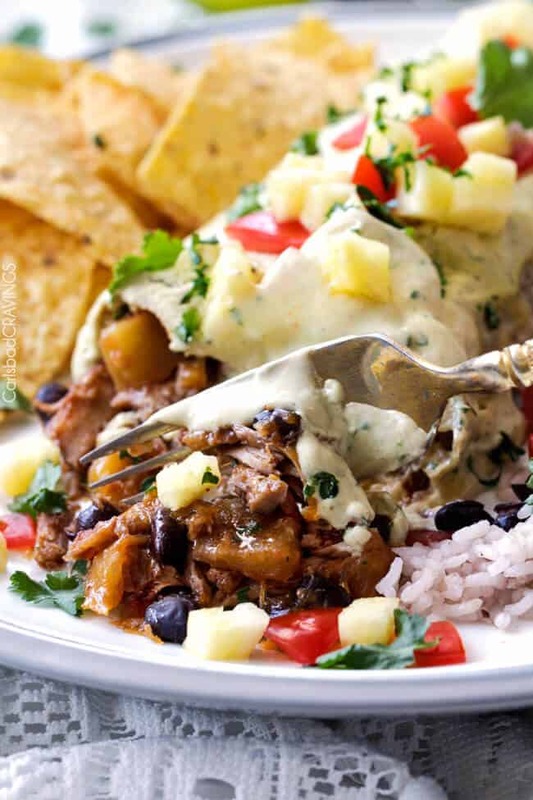 Want to try this Slow Cooker Pineapple Salsa Pork? 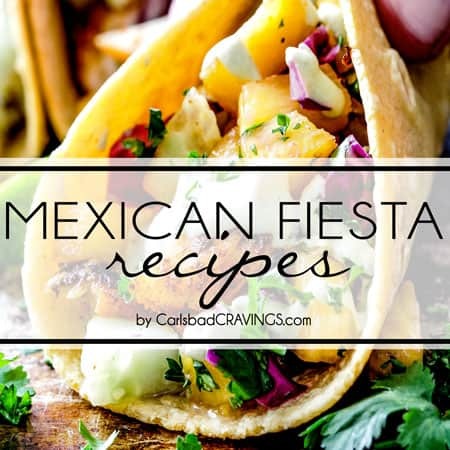 Pin it to your Crockpot, Beef or Mexican Board to SAVE for later! Add pork to large freezer bag along with marinade ingredients. Marinate 12-24 hours. Drain marinade and add pork to lightly greased slow cooker along with all remaining Slow Cooker ingredients. I recommend starting with 1 tablespoon hot sauce and adding more to taste at the end of cooking. Cook on HIGH for 4-6 hours or on LOW for 8-10 hours or until tender enough to shred. Shred pork then continue to cook on LOW for 30 minutes (time permitting), to soak in the juices. Taste and add additional hot sauce/salt to taste (I add more of both). Serve Pineapple Salsa Pork over rice or in tortillas, on salad, etc. with desired garnishes. *If you don’t like very much heat, then use 3/4 cup brown sugar. If you like more heat, then use 1 cup brown sugar which you will balance with the additional hot sauce. **You can use your favorite hot sauce but I strongly prefer the taste of Frank’s Hot WINGS sauce in this recipe. Frank’s Hot WINGS Sauce is much creamier and spicier than other hot sauces so it requires much less hot sauce - less hot sauce helps the pork not to have excess liquid. Life has gotten a little. . .okay. . .maybe a lot hectic for me as of late so I have definitely been relying heavily on my slow cooker so am always on the look out for new ideas when it comes to this kitchen essential. And what can I say about this pork and pineapple number? Not much is needed to convince me that a dish like this should make it on my menu on the regular. I absolutely adore this flavor combination. Hi Lynn! 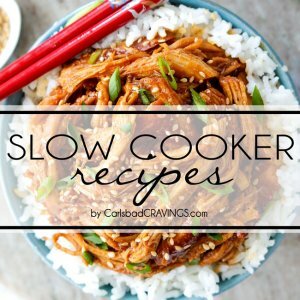 I hear you about relying on the slow cooker – it is so easy, convenient and delicious – I have a hard time NOT using it! 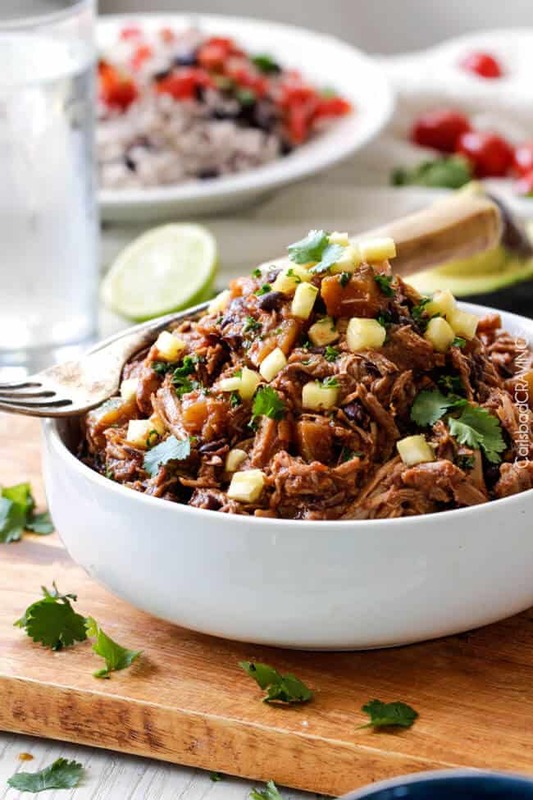 I am excited for you to try this pineapple salsa pork combo too – and yay for another use for the slow cooker! Thank you so much! We really are foodie kindred spirits! I love having backups too – I don’t like the feeling of being out of anything! I’m excited for you to try this one! Thanks Dorothy! Hi lovely lady!! The salsa, pineapple chicken I made last August, and YA was awesomeness! The aroma in our home all day… So, will be diggin on this one very soon. Am catching up on your posts for the last HOUR! 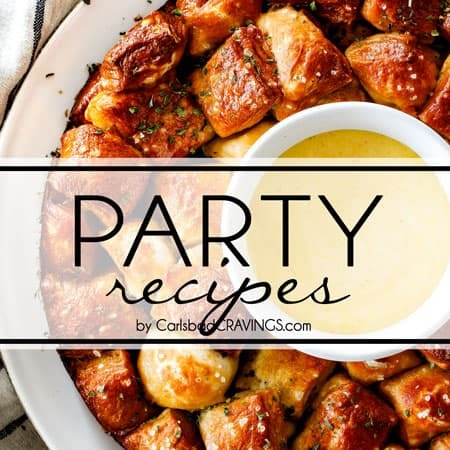 Was over at that cutie Nagis’blog, Recipe Tin Eats. 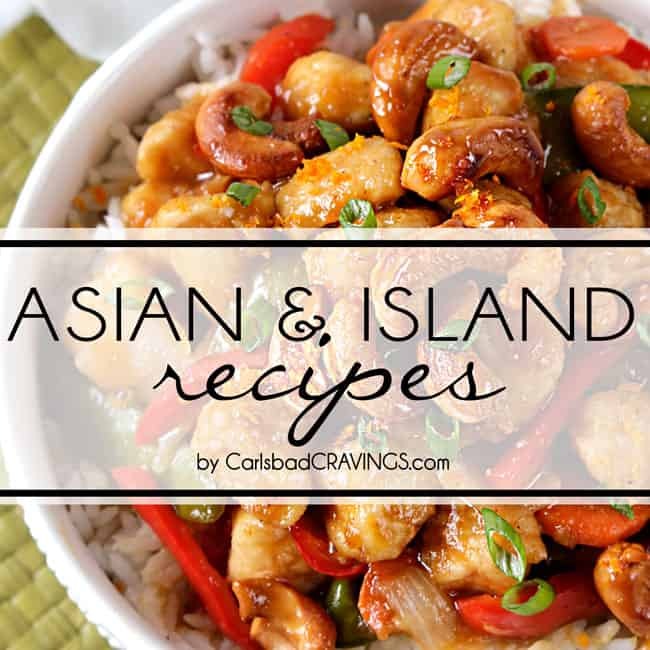 Pinned and printed a gazillion recipes. You had mentioned her awhile back.Was getting her newsletter and liked her as well. Knows her spices, and am broadening our horizons with varying ethnicities!Had a poopy head BLOCK me on Pinterest,after he FOLLOWED me! His home page said, “Please no pin raiders”.So, am guessing I am a pin raider! All I can say is wow! Pleas raid my pins! Sharing is caring!! LOL. 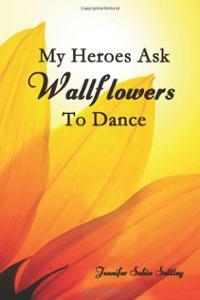 So,hope all is good, God Bless! I made this last week and it was AMAZING and I couldn’t believe how easy it was! 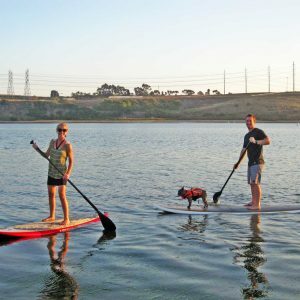 Thank you for a new family favorite! You are so welcome Miriam! I am thrilled its a “new family favorite!” Thank you so much! This was fabulous for a crazy day! Also, I tried it with those hint of lime tortilla chips…OMG. Amazing adding that lime flavor. Definitely keeping! Hi Lindsay, I am LOVING your idea of the lime tortilla chips, especially because I just had them this weekend with some guac and can taste the combo now – mmmmmmm! 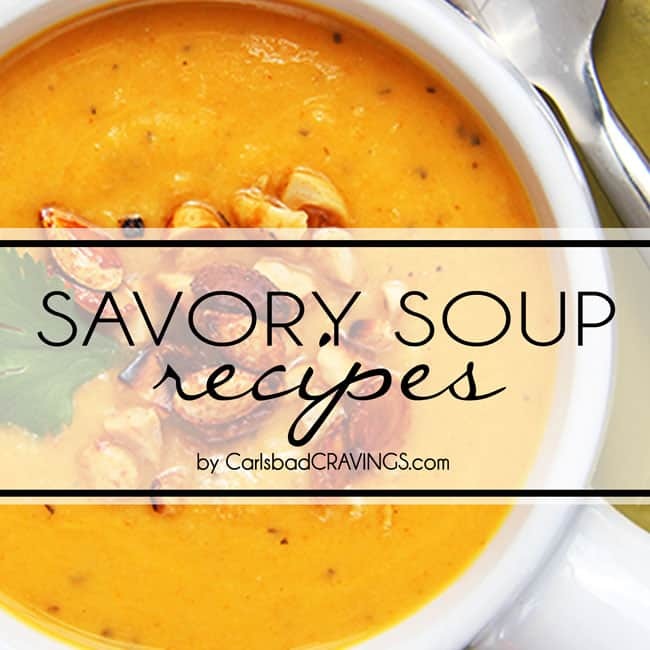 So happy you enjoyed this recipe and it was a keeper- yay, thank you!! 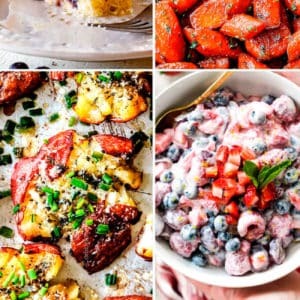 IS there a recipe for the pineapple salsa? Or is it the ingredients added to the pork? Confused. Hi Penny, all the ingredients including the pineapple and salsa that you add to the pork make the “pineapple salsa” Enjoy! 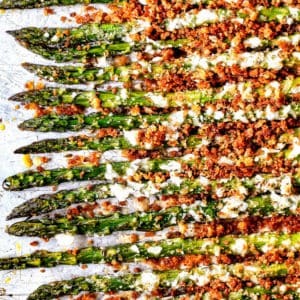 Can I make and cook ahead of time and then freeze? Thanks! Yes, that should work great. enjoy! Did you ever end up making the recipe for “Smothered Baked Pineapple Salsa Pork Burritos with Creamy Avocado Sauce” as you mention above? I tried your search function and didn’t see it 🙁 My husband loves when I make your recipes (which is basically 2-3 per week)! I’m on a quest to not repeat the same recipe twice in the same year, and so far we are over 9 months in and the thought of pork burritos is so enticing! Can’t wait to look back at my 2016 planner with notes to see all we’ve tried. 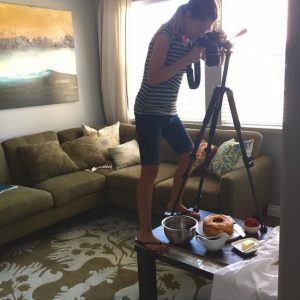 I’m so amazed by the talents many food bloggers have: I can certainly recreate any recipe without fail, but to come up with your own flavor and texture profiles is astounding. Keep up the good work so we can keep tasting 🙂 THANK YOU! 1. Prepare Pineapple Salsa Pork according to recipe directions. Drain any excess liquid. 2. Preheat oven to 400 degrees F. Line a baking sheet with foil and add a baking rack on top. Prepare burritos by adding a heaping 1/2 cup filling to each tortilla, top with desired amount of cheese and roll up burrito style. Place burritos on the baking rack and brush both sides lightly with olive oil or spray with nonstick cooking spray. Cook for 18-20 minutes or until golden. Broil to desired crispiness, flip over and broil the other side until golden. 1. Meanwhile, prepare Sauce adding all of the Creamy Avocado Sauce ingredients to your blender and chop then puree/liquefy until smooth. You can gently heat sauce on the stovetop to serve warm if desired or serve cold. 3. To serve, top burritos with Creamy Avocado Sauce and desired toppings. 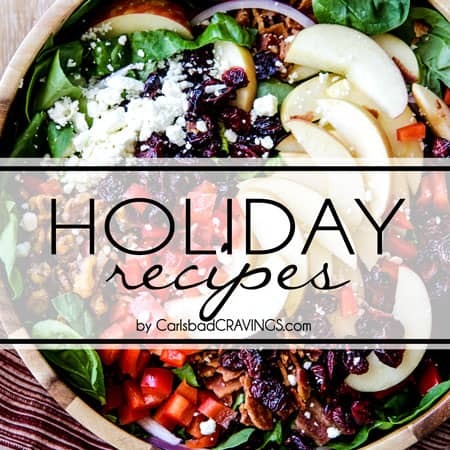 Cooking has certainly brought my husband and I closer together, and I hope many more people can find the value of family centered, homemade meals. We’ve also become healthier than we previously were simply by controlling the ingredients we put in our food. Life changing all around, right? Have a wonderful week! Hi Amanda, I’m so sorry for the delay as we have been moving and things have been crazy around here! I love hearing that cooking has brought you and your husband closer – what a fun hobby to do together – and more delicious 🙂 Wishing you the very best!